By Audrey Golden. Mar 9, 2018. 9:00 AM. Whether you are searching for a new graphic novel to buy the kids or teenagers in your life, or if you are adding to an ever-expanding graphic novel collection of your own, we want to make sure you know about the March Trilogy. This three-book set from John Lewis, one of the key figures of the American Civil Rights Movement and current Georgia congressman, is a memoir about his “coming-of-age in the movement,” according to an article in The New York Times about the graphic memoir collection. The books are significant for anyone hoping to learn more about the history of the Civil Rights Movement and Lewis’s experiences, and they are also important guidebooks for future leaders who are willing to make “necessary trouble,” as Lewis has described the act of protest. 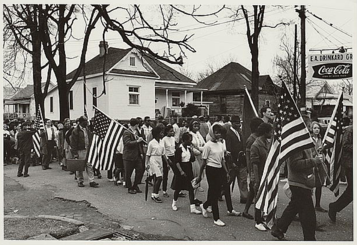 When you find yourself at the dedication page of March: Book One, you’ll see that John Lewis dedicated the first book “To the past and future children of the movement.” The book opens with an image of the Edmund Pettus Bridge, the site of the 1965 voting rights march from Selma to Montgomery. The first graphic image depicts the start of a day that became known as “Bloody Sunday” when Alabama state troopers violently beat demonstrators on the bridge for exercising a right to peaceful protest. While the books are at once memoir, they are also about the power of collective action and the power of protest. 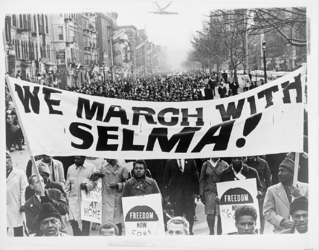 As The New York Times article suggests, “young people deserve a future in which they can conceive of their own participation, and this requires a past that, however long the shadow of its achievements, begins at their scale,” and March has the power to inspire younger generations to engage and to speak out against civil rights violations in the twenty-first century. All three books are now available as a set. Why not pick up a copy today?